Lucas' summer is ruined when his girlfriend Robin decides to be a camp counselor some distance from their Long Island home. He's doing some work for one of his father's businesses, but otherwise just hanging out with his friends Milton and Arno and his cousin Barry. His home life is not happy. He has a developmentally delayed younger brother, Alan, for whom he has to care; his mother gave up her career as a reporter years ago and seems perpetually depressed; and his father is controlling and distant, preferring to spend his time playing tennis at the club or seeing other women on the side than spending it with his family. Lucas does a lot of drugs, smoking marijuana daily and taking LSD when offered, although he wisely draws the line at heroin. A friend from work, Chris, who dropped out of school at 16, is fighting in Vietnam, and his letters worry Lucas. Lucas' cousin Barry, who is 4-F due to mental health issues, hangs out with a woman named Tinsely who is whole heartedly embracing the Free Love mentality of the era, and who is happy to share these experiences with Lucas, although he is somewhat conflicted about her philosophy in a very middle class, bourgeoise way. 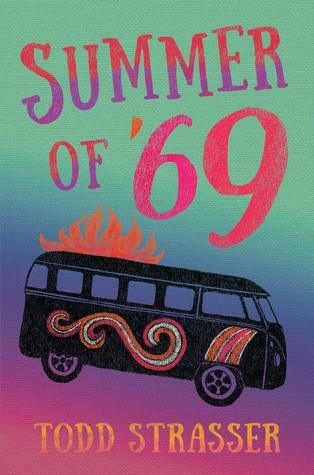 He and his friends do attend Woodstock, but instead of being the beginning of a carefree, happy lifestyle, it is the end of summer, end of Lucas' irresponsibility, and the beginning of the end of an entire era. This is the best description I have read about the different options young men pursued to avoid Vietnam. After Lucas realizes he has not been accepted into ANY colleges, he starts to panic and weigh his options. We hear about their friend Rudy's flight to Canada, stories of young men who try to smoke cigarettes dipped in ink to replicate symptoms of tuberculosis or who cut off fingers, and options that include jail time or taking the physical in San Francisco where the doctors are more likely to declare a 1-Y (qualified for service only in time of war or national emergency) status. Lucas spends a lot of time meeting with a draft counselor, although he is unable to secure a conscientious objector status. It is quite touching that one issue Lucas thinks his father is pushing on him for odd reasons turns out to be his father's way of getting him out of military service. Loosely based on some of his own experiences during this time, Strasser's details reflect a somewhat bitter nostalgia. During this summer, Lucas realizes that his self-centeredness hasn't helped him or his family, and he seems at a loss as to how to refocus his life. His family, shattering even as he watches, is no help. At first, I thought this might be a sequel to Fall Out because of the details about the family bomb shelter (and how many of those were used a decade later for teens smoking weed? ), but it's not. I am only about 15 years older than Lucas. This means that I was not surprised by the attitudes toward women and different sub groups that are described in the book. I vividly remember my parents gawking at hippies and making comments about their long hair! Alan is discussed as not having been diagnosed as "retarded", but still having difficulties. This was a standard term at the time, although it is very offensive today. The family dynamics were also something that seemed fairly common. However, I was very surprised at the amount of drug use in a middle class, suburban setting, especially since one of the characters is actively dealing and making quite a bit of money. A nice detail was that Lucas kept his condoms and weed in a sock in the back of a drawer, where it was meant to be found, but in order to get to his pills and acid, he had to unscrew the bottom of his stereo. Very little of what I read is aimed at readers higher than middle grade, so it was an absolute delight to revel in Strasser's sparklingly dark prose, with its elegant turns of phrase and inventive combinations of words. This does have sexual content, language (although the f-bombs were used very judiciously for YA), and abundant drug use, but is the only book I have read about this time period that made me really understand what all the sturm und drang among teenagers was about. Summer of '69 rings absolutely true to the Vietnam era in ways most people have forgotten.